Condense Time And Get Bigger And Stronger Faster! In this article, I am going to reveal two training protocols that you can cycle between indefinitely to keep the gains coming fast and furiously! They are known as EDT and PTP. Read through here to see if they are for you. When I was in the sales world, I realized real fast that I do not get paid for simply showing up or pretending to work. Most people get paid for working eight hours a day. However, how much work is actually being done in those eight hours? From what I saw, not too much. At least half of the day was wasted on gossip, doing tasks inefficiently, wasting time in unnecessary meetings, and talking about things instead of taking action. Just pretend for a minute that you are in sales and imagine what you would do if your boss makes you the following offer: do the required amount of sales for the day and you can go home anytime you want. Moreover, if you meet your monthly quota in two weeks, take the rest of the month off. What would you do? Personally, I would find efficient means to get the job done efficiently so I do not have to waste time. After all, the more I achieve in less time the more money I make. If it takes 2 hours to make $500.00, I am making $250 an hour. If it takes eight hours to make $500.00, I am only making $62.50 an hour. If you have half a brain the former will sound more appealing than the latter. The way that you approach bodybuilding should not be any different. You do not get bigger and stronger the longer you stay in the gym, you get bigger and stronger based on how efficient you are in the gym. I would rather spend one solid hour in the gym and maximize every minute to gains than mess around for several unfocused hours. In this article, I am going to reveal two training protocols that you can cycle between indefinitely to keep the gains coming fast and furiously! The combination of these two workouts will allow you to condense time and maximize your time training. Thus, you will achieve more in less time. I like to call this combination: condensed training. The first super effective training protocol for maximizing your training time is called EDT (Escalating Density Training). EDT is the brainchild of top strength coach Charles Staley, author of The Ultimate Guide To Massive Arms: Escalating Density Training. A few years ago Charles realized that the key to getting bigger and stronger lies in doing more work in the same amount of time. Things such as rep speed and feeling the muscle are really not that important. The key to packing on size is to progressively increase the intensity, volume, and density in each training session. Here is how EDT works. Take two exercises that work antagonistic muscles. 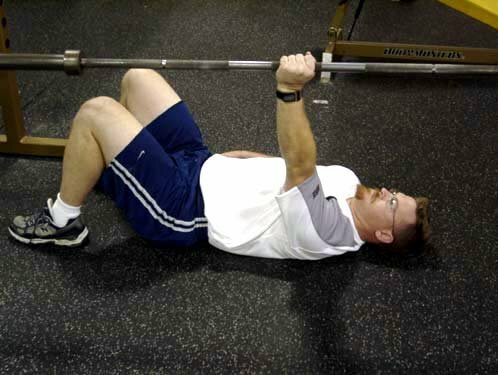 For example, the bench press which works the chest and the bent over row which works the lats. Take your ten-rep max on each exercise and do as many reps of five of each exercise in a designated time period. Coach Staley refers to this time period as a "PR (Personal Record) Zone". 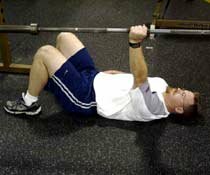 The Bench Press & Bent Over Row. To illustrate, lets say that the PR Zone is twenty minutes. Set a stopwatch for twenty minutes and do as many reps as possible on the bench press and bent over row. Do the exercises back to back. In other words, do one set on the bench press, wait thirty seconds, do a set on the bent over row, wait thirty seconds and do another set on the bench press etc. Once the twenty-minute period is up, the PR Zone is over. Record the total number of reps for each exercise. Lets say that you completed thirty-five reps with 225 lbs. on the bench press. Your goal at the next workout is to complete a minimum of thirty-six reps. As long as you are doing more reps in the same amount of time; you are increasing the intensity, volume, and density and will pack on some meat. When you can increase the total number of reps by 20%, increase the training load by 5%. 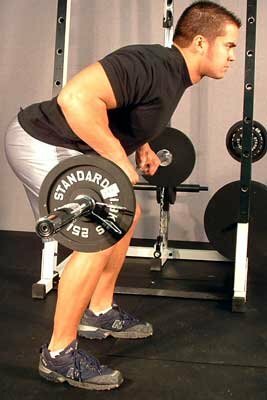 For example, lets say that you do twenty-five total reps on the bent over row with 200 lbs. at your first EDT workout. When you can complete thirty reps, increase the training load to 210 lbs. Make sure that you use solid form at all times. Do not cheat in order to get more reps. I tried EDT around a year ago and was amazed with how well it worked. Before using EDT my previous best on the military press with two 70 lb. kettlebells, was six reps. After only two weeks of EDT, I nailed nine reps. I had been stuck at a plateau for months before that and was elated to say the least. Moreover, I got several comments from people that my shoulders were looking much bigger. I liked EDT so much that I bought the company! Just kidding. However, I placed several of my online consulting clients on EDT programs. As the feedback started rolling in, there was no doubt in my mind that EDT was effective. Here is what my client Patt Drawe stated about the EDT program that I designed for him, "I&apos;m in my fourth week of EDT and I&apos;m happy to report that in one month I have made more progress than in the previous three months! It works, and the feeling of accomplishment is a great motivational boost as well. I don&apos;t max out much, but my working weight on the bench has increased by about 20 lbs. in the four weeks." Keep in mind that Patt is an experienced trainee. When was the last time that you saw an experienced natural trainee pack on 20 lbs. on his or her bench press in four weeks? That&apos;s more than most trainees pack on in a year. Patt was definitely not the only client of mine that benefited from EDT. My client Mike Brown (interview) went from barely pressing two 70 lb. kettlebells for two reps, to twelve sets of three in just a few weeks. A few months later, Mike military pressed two 88lb kettlebells for ten reps! Okay, lets get into how to design an EDT program for maximum increases in size and strength. Now if your number one goal is to increase the size of your arms, get Coach Staley&apos;s book (Get his book regardless of what your goals are as it is excellent) by going to www.edtsecrets.com. I am not going to cover any specialization programs in this article. Instead, I am going to go over a full body program that dozens of my clients have used successfully. Click Here For A Printable Log Of PR Zone 1. Click Here For A Printable Log Of PR Zone 2. Lets go over some key points on the exercise selection here. 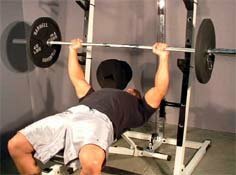 One, why do bottom position bench presses and squats? They are much harder than regular bench presses and squats. You have to generate a great deal of power to move a heavy weight from the bottom position and you will be amazed how much weaker you are when you try this drill. It is safer. EDT is hard work and you move at a rapid pace. 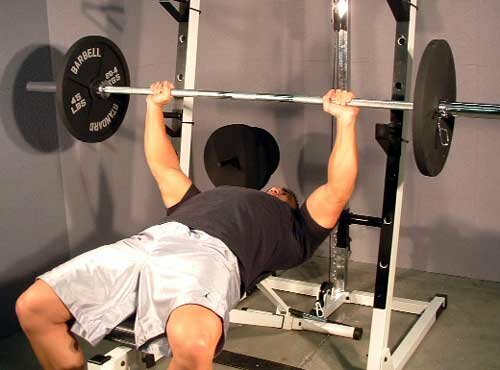 The bottom position bench press and squat in a power rack will allow you to bench press and squat safely. In addition, they provide the convenience of not relying on a spotter. Next, antagonist exercises are paired up in each PR Zone. The barbell bent over row is an antagonistic exercise to the bench press. While you are working one, you are warming up the opposite muscles. This will provide the benefit of being much stronger on each exercise and will build balanced muscles. Just as the barbell bent over row is antagonistic to the bench press, the stiff legged deadlift is an antagonist exercise to the barbell squat. The stiff legged deadlift will add mass to your hamstrings, while the Squat primarily focuses on the quads. Next, instead of doing isolation exercises such as the triceps pushdown and the triceps extension, I am going to have you do the military presses from the nose. This is a power move that will blast your triceps into the stratosphere. Again, use a power rack and set the pins at nose level. The weighted chin-up is an excellent antagonist exercise for the nose-level Military Press. Unlike bicep curls, the chin-up forces you to work with your bodyweight, which will pay off with major dividends. If you are not strong enough to do weighted chin-ups, start off with your bodyweight. Finally, with calves, there really are not any antagonistic exercises. No bid deal as this makes for a convenient area to add in some stomach work. The weighted sit-up will get the job done. Just hold a barbell plate on your chest and you are ready to go. Regarding breaks between sets, start off by taking thirty- second breaks in between each exercise. Make sure to do the exercises in each PR Zone in super set fashion. In other words, do a set of bench presses, wait thirty seconds, do a set of bent over rows, wait thirty seconds, do another set of bench presses etc. As fatigue kicks in, increase the breaks to one minute. Also, do not go to failure or compromise form to get five reps on each set. If you get to the point in which you can no longer complete five reps with solid form, decrease the reps. The goal with EDT is total reps completed, not reps per set. Do what you have to, to keep the reps accumulating from workout to workout. In many of my EDT workouts, the final sets in each PR zone were reduced to doubles and singles. Make sure to take a day off in between each EDT session. For example, do workout one on Monday and then take Tuesday off. Proceed to workout two on Wednesday and then take Thursday off. EDT is super hard work so expect to be sore after the first few workouts. You will adapt though and in addition to building some major mass and size, will acquire killer conditioning as well. As effective as EDT is, four to six weeks is pretty much the limit of what most trainees can tolerate before burnout kicks in. I recommend that trainees switch to a lower volume program for four weeks for every four weeks of EDT. Top strength coach Pavel Tsatsouline&apos;s PTP (power to the people) program is just the ticket to transition to after four weeks of EDT work. Instead of jut going into maintenance mode for a month. An Evil Weekend With The Evil Russian! I learned more during the Kettlebell certification weekend regarding productive strength training than I had learned over the last ten years of my lifting career. Pavel&apos;s PTP program will allow you to continue to get bigger and stronger. PTP is another example of condensing time and making workouts far more efficient. With PTP, Pavel recommends two primary exercises. Number one is the deadlift. Pavel states that the deadlift is one of the best exercises for packing on strength and size as it works more muscles than any other drill. 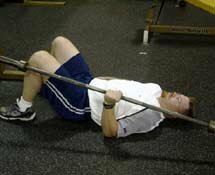 Next, Pavel recommends either the barbell side press or the floor press as the upper body exercises of choice. Floor Press, Shown One Armed. In addition to only concentrating on two exercises, Pavel recommends no more than two sets of five per day for strength training. The first set is a heavy one and the second set is completed with 90% of first set. Finally, you train five days a week on the PTP program. Now at this point I know what you are saying. How can you possibly get bigger and stronger with only two sets of two exercises per workout? First, training has to do with quantity not quality. Remember the analogy that I used at the beginning of this article. It is not how long you are at work, but what you do at work. A few sets done right are much better than a dozen sets done wrong. Also in Pavel&apos;s excellent book Power To The People, Pavel reveals several tips for recruiting as many muscles as possible in each exercise to maximize strength and make your muscles hard as a rock. For more info on Pavel, go to www.powerbypavel.com. Second, due to the frequency of PTP training the weekly volume is hardly low. Each week you are doing a total of ten sets. Instead of doing ten sets on one day and taking seven days off, you are breaking the ten sets over five days. The frequency of Pavel&apos;s program will shock your body into new levels of growth. The more frequently that you can hit a muscle with adequate recovery, the faster it will grow. Now I like the program that Pavel outlines in his book for people that want to get strong without adding any weight. However, for bodybuilders I recommend a few more exercises to induce hypertrophy and for training variety. What are the exercises? Lets add the weighted chin-up, the dumbbell press, the bent over row, the squat, and the Military Press to the deadlift. Also, instead of doing the same exercises every day, lets do some alternating throughout the training week. Pavel recommends taking five minute breaks in between each set to maximize strength. Since we want to focus on building big muscles, I am going to have you take two-minute breaks between each set. Similar to EDT, the exercises will be done in antagonistic fashion. Here is how the sets will breakdown. Do five reps on the first set. Even if you can do more, stop at five. On the second set, shoot for seven reps. When you can nail seven reps on the second set, increase the weight by 5% at the next workout. Otherwise, stay at the same weight until you complete seven reps on set number two. Click Here For A Printable Log Of Mon-Wed-Fri.
Click Here For A Printable Log Of Tues-Thurs. Do not worry if the prospect of only doing a few sets at each workout sounds unappealing. After a month of EDT, you will welcome the lower volume workouts. What you like does not really matter anyway. Serious trainees want results and the back-to-back combo of EDT-PTP will deliver just that! Stick with PTP for four to six weeks. At that point it will be time to ramp up the volume and intensity again and plug into another EDT workout. By combing EDT and PTP into an 8-10 week training cycle, you are taking advantage of one of the most effective training concepts in the world known as periodization. 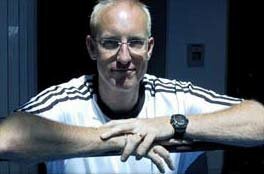 The concept of periodization was popularized by top strength coach Tudor Bompa. Basically, with periodization you breakdown the entire year into training quarters. For example, an athlete might spend four months working on muscular endurance by working in the 12-15 rep range. Then spend another four months on hypertrophy, by working in the 6-8 rep range. Then finally spend the last four months of the year working on brute strength in the 1-3 rep range. Looks great on paper. However, there are two major drawbacks. Four months is a long time to spend on one area of training. For many trainees, four months of 12-15 reps per exercise will get old real fast. Your body will adapt to what you subject it to. In four months of doing endurance work, you will become very good at endurance work. However, after four months of doing brute strength work, You will probably lose the benefits of the endurance work that you did earlier in the year. Thus, instead of breaking training down over the course of several months, condense the periods and do much smaller cycles such as four weeks instead of four month. That is precisely what we are doing with the EDT-PTP. You will not lose any of the results that you achieve with EDT, during the PTP cycle. In fact, the opposite will occur. You will be stronger, bigger, and refreshed for another EDT cycle. Vice versa as well. After each EDT cycle you will have more high quality muscle mass to maximize your strength for PTP. You will still get bigger with PTP, but that is not the emphasis. In addition, studies show that your body generally adapts to a given workout regimen after three to four weeks. With the EDT/PTP combo you stay one step ahead of plateaus that may occur by constantly switching gears. In addition to keeping workouts fun and fresh, your hard work will be rewarded month after month. Now stop wasting time reading this article. You have work to do! Clear EDT/PTP with your doctor before starting. Especially if you have any heart problems or high blood pressure. Make sure to drink a protein/carb drink immediately after each workout to enhance recovery. Get a cryocup (call 1-800-ICE-5722) and ice your legs down after each workout. Get a sports massage once a week or at least twice a month to enhance recovery. 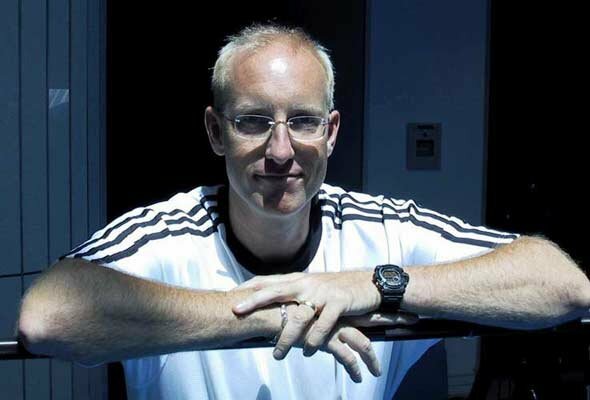 Mike Mahler is a strength coach and kettlebell instructor based in Santa Monica, Ca. For more strength and training tips, visit his website at www.mikemahler.com.